When Horton & Associates, a supplier of audio and video equipment for healthcare facilities nationwide, needed durable equipment to use in hospitals and treatment centers, it chose Videotel Inc. and its HD2600 industrial grade DVD player to become its reliable solution. Specifically engineered as UL-approved and AnnexQ compliant for use in hospitals and healthcare facilities, the HD2600 helps these facilities improve communication, educate, interact, entertain and increase awareness with patients. It is a true commercial grade looping DVD player designed for rugged use and displays video content on any screen. The HD2600 is designed to turn on, play automatically, repeat and auto loop without any manual interaction. “Videotel's industrial-grade DVD players and industrial media players definitely fill a need in the healthcare market that we consistently service," says Daniel Horton, president of Horton & Associates. The HD2600 is incomparable in quality and reliability. For healthcare facilities that need reliable digital media solutions to enhance the patient’s experience, the HD2600 DVD player is a solution that allows for continuous play 24 hours a day, seven days a week, 365 days a year. 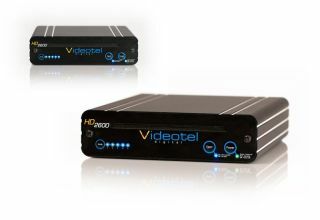 Built to handle the rugged demands of looping video content, the HD2600 is ideal for environments that desire a cost-effective solution to inform and entertain patients.